​Adopt-a-Family for this Holiday season. Each Holiday season the Lake Saint Louis Mothers Club Adopts a local family who needs help with purchasing holiday gifts for their family. We appreciate any amount you can donate to help us support a local family in need. On behalf of the Green Tree Elementary PTO, I would like to thank you for your generous donation of $100, which the PTO received on July 18, 2017. Your contribution makes it possible for us to continue to support the education experience of the children at Green Tree Elementary. Thank you for awarding me the LSL Mothers Club scholarship. I was extremely appreciative to learn that I was selected as the recipient. You have helped me with the financial burden of college and I promise that I will work hard and continue to achieve great things as I go to Missouri S&T. Thank you so much for choosing me to receive one of your annual senior Mothers Club scholarships. I feel so lucky to be part of a community that offers such a variety of educational and fun programs for kids and then, as a high school student, being able to help teach and be a role model for children's programs. This summer is my third year being a camp counselor at the LSL Summer Gator Camp. I love when the kids come up to me at the stores to give me a hug. It really makes our community feel like home. I am excited to be graduating from Hold and then starting a new phase of my life at Truman State. A special thanks to Aisha & Adrianna for coming out last week to present the award to me. I am very grateful for your kindness. On behalf of the Board of Education and the students of the Wentzville R-IV School District, I would like to take this opportunity to thank you for the following generous donation of $200.00 towards supplies for group meetings. For tax purposes, please note that the Wentzville R-IV School District did not provide any goods or services to you in consideration, in whole, or in part, for your $200.00 contribution. We are very appreciative of your kindness. I would like to thank you for being a part of the local scholarship program at Timberland High School this year. Whether you are an individual, a family, or an organization, your efforts are truly appreciated by the students and the staff. Please know that your contributions are making a difference. Your investment in our graduates is an investment in the future. I will look forward to working with you again next year. In the meantime, please don’t hesitate to contact me if I can ever be of help. Thank you! Dear LSL Mothers Club, Thank you so much for your contribution to the Wentzville Holt High School Grad Night 2016. Your contribution will help provide our 2016 Holt graduates with a safe and memorable evening. We really appreciate your support! Dear Members of the LSL Mothers Club, Thank you so much for your generosity and thoughtfulness. The family who received the dental voucher was so grateful and appreciative. We do appreciate your donation in support of our families. Dear Member of the LSL Mothers Club, I am writing to thank you for the excellent Halloween event you hosted on Oct. 24. My 2 1/2 year old granddaughter had such a great time. It was very well organized and everyone was so friendly and thoughtful. ​I just went to the financial aid office to sign the check today! Once again thank you so so much for this scholarship. Thank you so much for your generosity in awarding me the scholarship of 2014. I plan to use the money next year towards my tuition at the University of Missouri, Columbia. Thank you so much for your generosity! Thank you so very much for your recent donation to the Wentzville School District Parents as Teachers. We will use the funds to support our Group Connections that are open to all families with children birth to age 5. I am attaching a list of these meetings so your members can attend. Thank you again for your continued support of our program. Thank you so much for the $100 donation! It is greatly appreciated. It is so great to have the support of the Mothers Club. you enjoyed the display on July 4th! Thank you so much for your contribution to the Wentzville Holt High School Grad Night 2013. Your generous contribution of $100 helped provide our 2013 Holt graduates with a safe and memorable evening. We really appreciate your support! "I wish to thank you for awarding me the Lake Saint Louis Mothers Club Scholarship. It means a lot to me and my family and I know it will help me to achieve success in my future education. Thank you again. My name is is Amy Koester, and I am the children's librarian at Corporate Parkway Library. I want to thank the Lake St. Louis Mother's Club for your generous donation and support of children's services at our library. With your recent gift, I was able to purchase Doodle Pros for use in the children's area. 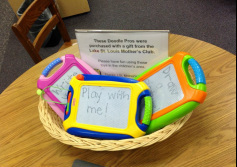 I am very excited that our library can offer these early literacy toys, and I cannot wait to see children practicing their letters, drawing pictures, and using their imaginations as they have fun with them. I have attached a photo of the Doodle Pros out in the children's area; I hope you and your members will stop by to enjoy them with your own children! Please extend my thanks to the rest of the Lake St. Louis Mother's Club. Your continued support of the library is much appreciated. Thank you for your $100 donation to help support the Jr. Tennis Program. We really appreciate your involvement with us and the LSL community. "Thank you so very much for thinking of our family during the holidays. We appreciate all the gifts and gift cards. Our son's truly had the best Christmas because of our blessing of you all. God Bless you All"
Thank you so very much for your recent donation to the Parents as Teachers Program. The money will be used to support our "Toddler Town" group meeting on Saturday, October 20, 2012. We invite any members of your organization to attend this activity filled event. As funding for our program has been drastically reduced, your generosity enables us to offer opportunities for development to the youngest members of our school district. Thank you again for your constant support of our program. "Thank you so much for choosing ME to be the recipient of your scholarship. I am so happy to know that you support my plan on making a difference in other people's lives. I will do the best I can to represent and serve you well. I look forward to meeting you." Below is a list of donations as an example of the widespread contribution we are able to make due to our volunteer efforts and the support of the Lake Saint Louis community.